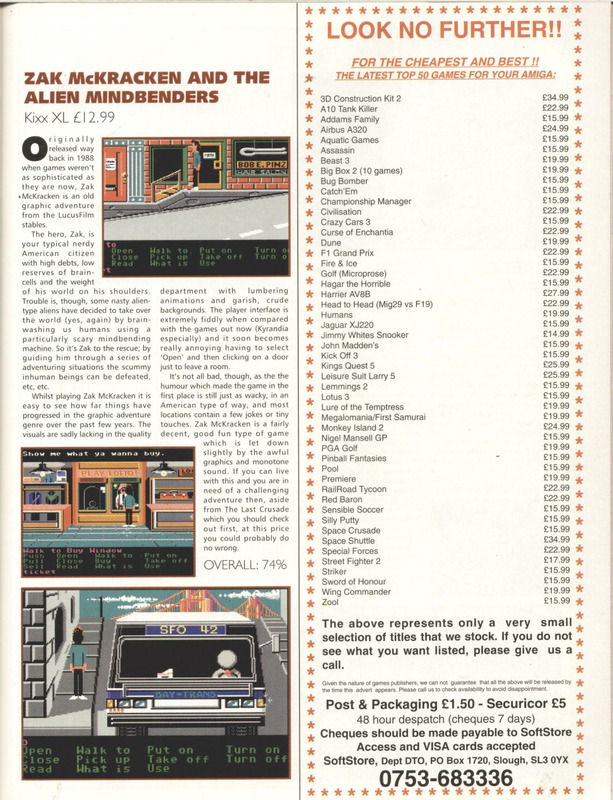 "one of the top five adventure games I've ever played"
"Still considered as the best C64 adventure ever"
"one of the greatest games ever"
"story gets my first ever 10/10"
"one of the most innovative and challenging adventure games ever released"
"the best game I have ever played for intuitive puzzles"
From probably the best review I have ever read, by "Secret Cow": "It felt like playing a movie, in a way that the FMV games that followed in the early-90's utterly failed to do. It was like you were inside an Indiana Jones world with the sensibility of Mad Magazine, and you could do anything that you wanted to. 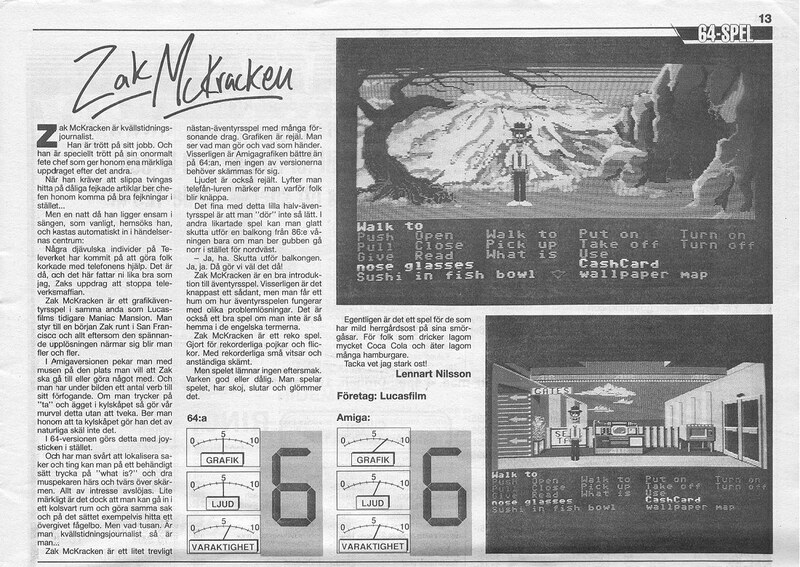 [...] Zak McKracken opened my eyes to what games could be. They could tell stories. They could form an emotional connection between the player and the characters. They could be cinematic. They could be open-ended. And they could be spring-loaded busy boxes full of fun and surprises just for their own sake. 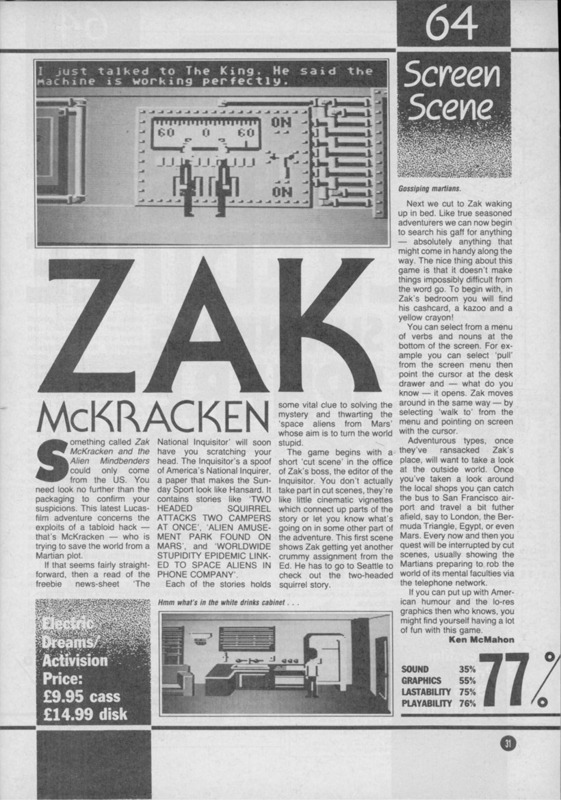 To sum up, Zak McKracken made me feel like games were genuine entertainment in the same class as books, TV, and movies. From then on gaming wasn't just something something I'd do when I was bored." Note that some reviews criticize the game for having to click on "open" to open a door. Silly reviewers! There are keyboard shortcuts! Every criticism I have ever seen is a result of not noticing something. E.g running out of money (there are ways to get money - that's part of the game), or getting stuck in mazes (mazes are either very simple, or have clues above the correct doors, or are easy to map on paper). These reviewers are expecting a shallow or badly made game, so do not look any deeper. Most of these reviews are from online, English language sources. If you know of any printed reviews, or non-English language reviews, please send a summary for inclusion on this page! Thanks. I haven't included many bad reviews on this page. I don't want to embarrass those reviewers by showing the world their poor judgement and lack of taste. LOL. But if you really want to see the dark side, click here. "Overall: 10/10, it's an underrated classic that seriously needs a sequel." 9/10: "A Great classic from Lucas Arts. If you like classic adventure games try and find and buy this game." 10/10 "Fans of puzzling, yet kooky adventure games among the lines of Maniac Mansion will certainly find the gold mine within Zac McKracken"
"This game is funny, challenging, intriguing and addictive. I really fell in love with 'Zak McCracken'. " "A thoroughly amusing game so don't be put off by the name. This one is not just for kids, in fact the puzzles get quite complicated at times and the solutions are often quite zany but strangely logical within the context of the game. ... This game was first released in 1989, and although it is showing its age in both the graphics and sound departments the puzzles are as challenging and engrossing as ever"
"This is one of the very first LucasArts adventure games and also happens to be the one that single handedly started my "career" in the genre. I fell in love with this game at the very first sight and haven't fallen out of it since. ... I'd have to be a hell of a lot better a writer to give you even the slightest idea how much fun this game is." "I'd have to say that this is probably one of the top 5 adventure games I've ever played, with the only ones on the list that top it also being LucasArts games. It's really a shame that nobody writes these games as well as they used to." 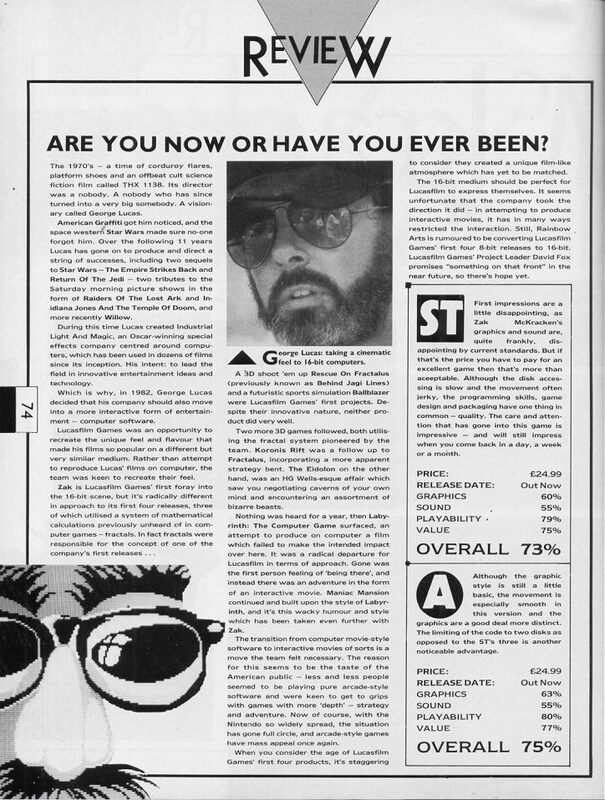 ... "the first game that really got me going with the amount of background story" ... "the graphics blew everything else out of the water on the ol' Commodore 64. Plus it had "cutscenes" which I don't remember seeing in any game prior to this." ... "Back in the days of the C-64, sound for this game was awesome." 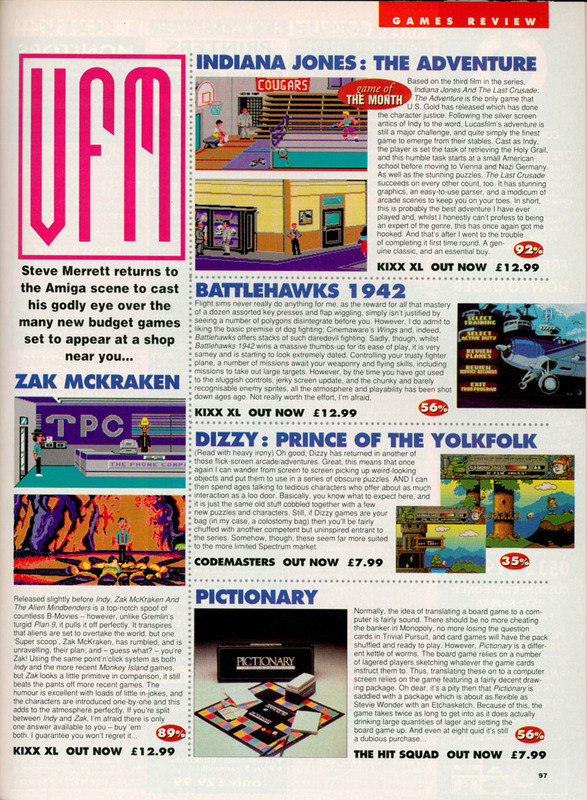 ... "pick up the greatest in Commodore gaming history at C64.com. Zak McKracken is currently the 6th most popular d/l over there." 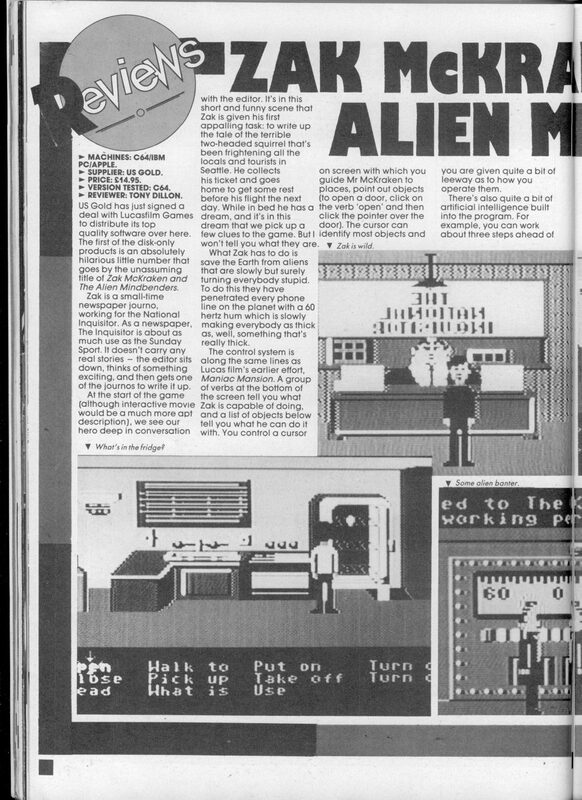 "A good game and a bit funnier than Maniac Mansion"
"A truly great game. Very well done. .. Under-rated and almost totally forgotten, but I guarantee you'll like it." "This game is right up there with lucasarts own monkey island in my opinion. ... Proof positive that eye candy and sonics are irrelevant if the plot and characters are first rate. ... An absolute top of the range adventuring masterpiece, should be in a museum." "One of the greatest games ever!" 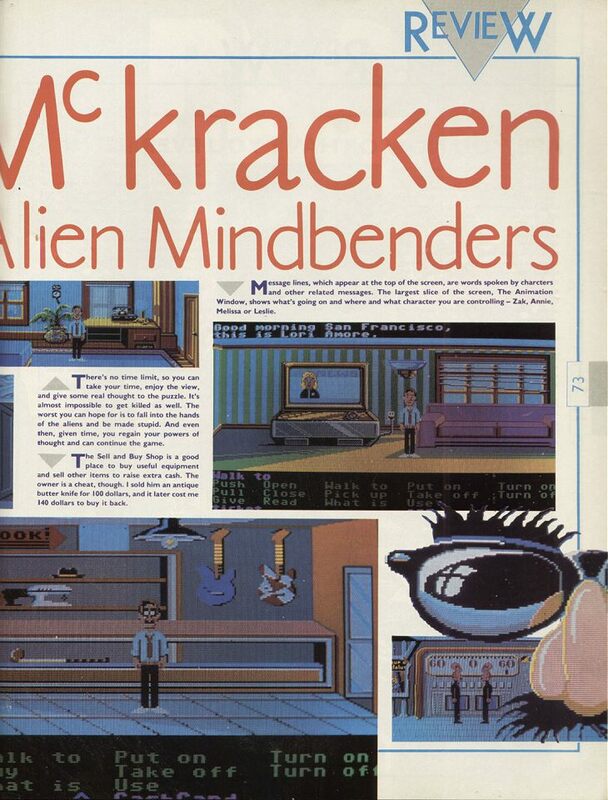 "One of the forgotten SCUMM games, but its still one of the best"
Eloquence: "Definitely one of the best adventure games ever made"
SamNMax: "Zak Mckracken and the Alien Mindbenders has been adored by many adventure gamers over the years. Whenever you ask a serious adventure gamer what they think of the game, they would probably say something along the lines of 'ridiculously underratted'. And who could blame them?" [SamNMax does not like the 1980s verb-selection system, and dislikes the mazes, so these score low. But he reserves his greatest praise for the story:] "Zak is an award winning adventure for it's unforgettable story, and rightfully so. At the time, this had the funniest, greatest, and most original story I had ever seen. .. Story gets my first ever 10/10"
Eriq: "one of the most innovative and challenging adventure games ever released. 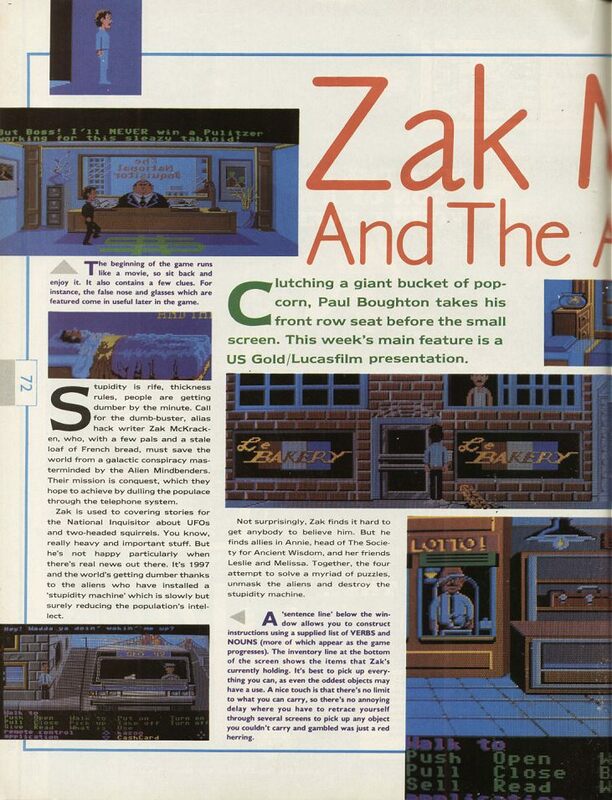 ... We all have one or two games that really remind of us the good old days of adventuring and Zak was definetely IT for me." Kolzig: "If I'd have to give it a score, I'd give 9.0/10. The intro theme is legendary, I can still sometimes find myself whistling the theme song in random situations." Matthew S.: "This game is loads of fun, so plan to waste hours trying to open that big red door on Mars, playing a kazoo, and dealing with a particularly nasty airline stewardess. A great game." 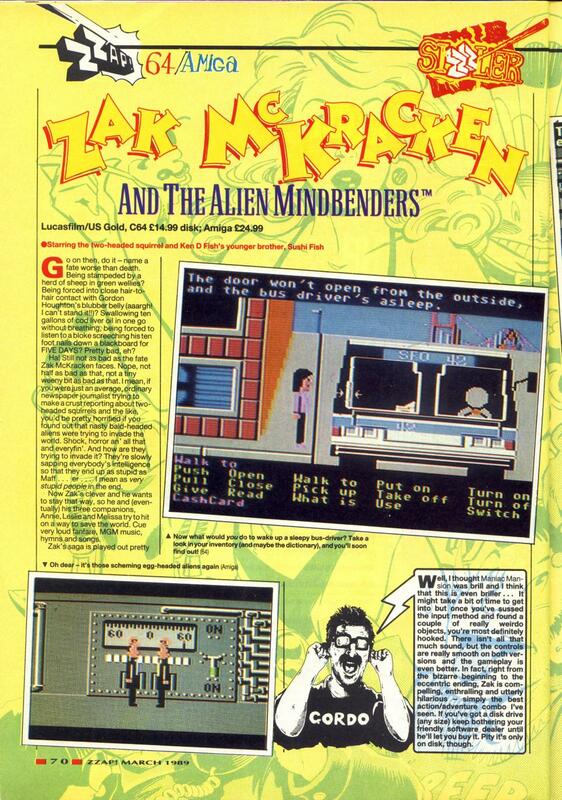 Dave Seaman: "one of my all-time favourites"
Zzap!64 gave Zak McKracken and the Alien Mindbenders a 93% rating in their 47th issue. 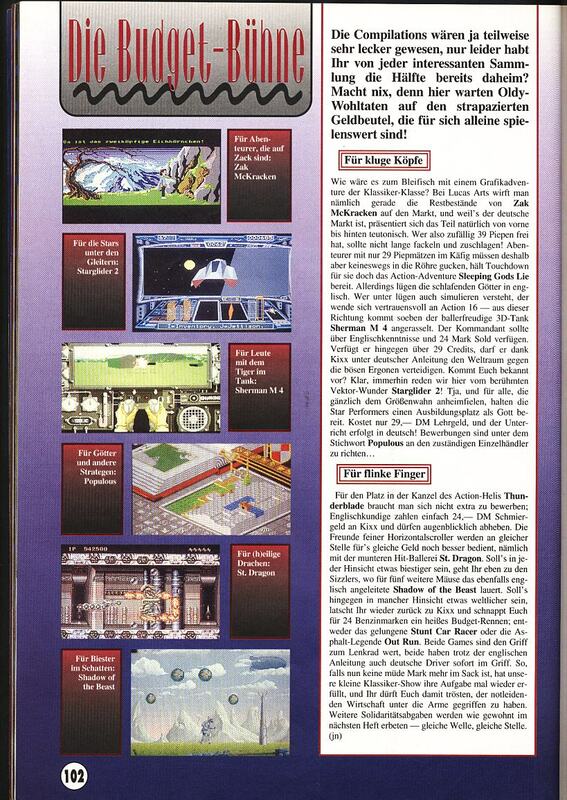 Powerplay gave the DOS version of Zak a 91% rating - for screenshots, see the page of magazine articles . "If you want lots and lots of humor, animation, adventure and just plain fun, go out and buy Zak McKracken and the Alien Mindbenders." 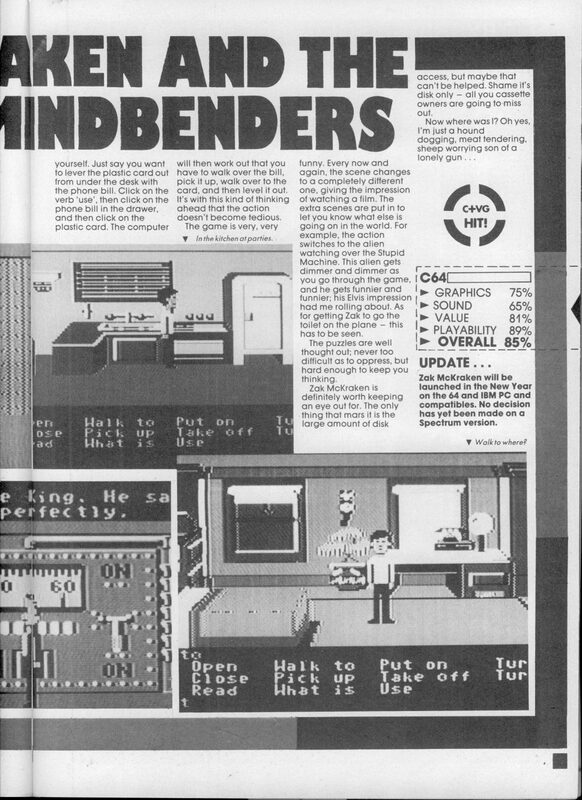 "Thinking about it, the best game I have ever played for intuitive puzzles has to be the aforementioned Zak McKracken And The Alien Mindbenders. There's a whole horde of inventory items in Zak McKrack, and I could give a thousand examples of puzzles with several alternative solutions. How about using a monkey wrench to wake up the bus driver, but also being able to do the same with any other long, hard item in your inventory, AND having the option of waking him with a merry kazoo interlude instead? You can use a butter knife to get a cashcard from under a desk, but you can also use any of the several pieces of paper, all of which can also be used for drawing maps. Then, when you try to lever up floorboards with the butter knife, it's obviously too flimsy, and you get left with a bent butter knife. Having so many possibilities and so many avenues to explore not only constantly rewarded the player's intelligence but provided the vital encouragement needed to make them push through to the very end." Atebash: "Still considered as the best C64 adventure ever ... You must play this if you haven't done that before!" Anonymous: "Even better than Maniac Mansion. ... A funny game that is sadly overlooked." Geoff Howland: "one of my favorite games ever"
Happy Clicker: "my all time favorite game"
Various people at Geek.com GameGeek: "still great" ... "awesome" ... "the phatest Game i ever played" ... "Zak McKracken rocks"
Please remember that fan made sequels are made by - er - fans. Yes, the game is shorter, and there aren't as many hotspots (that was my only complaint) but the creators don't get paid, and they don't charge you any money, so quit complaining already! "The game play is great and the puzzles and humour make the game a worthy successor of the original title. The New Adventures of Zak McKracken is one of the few freeware adventure games that I really enjoyed and is definitely worth the download." From a visitor to the site: "I love the original and I love this one too!" "An excellent fanmade game that stars one of LucasArts' most beloved characters ... 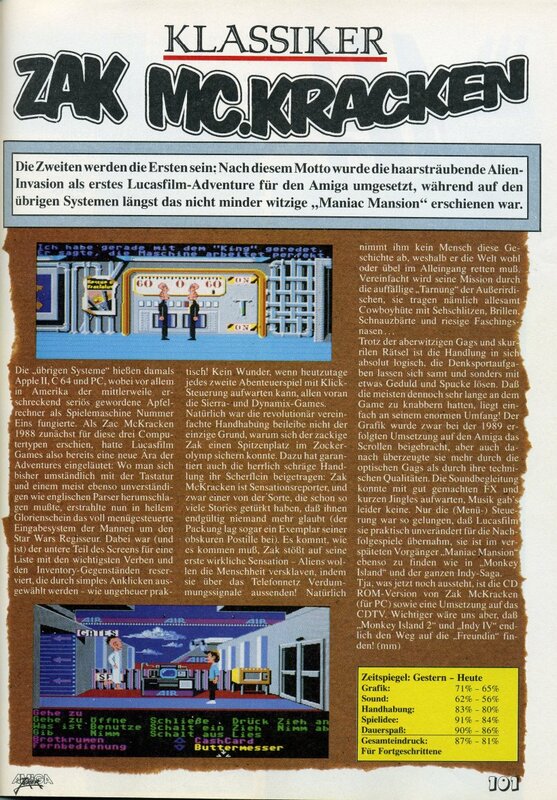 Anyone who has played the original game (and you simply must play it if you consider yourself an adventure gamer) will feel right at home with TNAOZM. ... The puzzles are not as ingenious as in the original game, but they are pretty decent and not repetitive. ... A wonderful and polished fanmade adventure that remains true to the spirit of LucasArts. Recommended!" Ryvvn: "Only complaint is that the game is rather short. ... However, it is still an ideal sequel!" Ozwalled: [after various minor criticisms] "If you loved the original, I still think it's worth playing."